November 28, 2018, 10:02 PM · Do you know of a piece by a Black composer that my child could learn? Or that I could play for my recital? Or that my beginning student could learn? These are the types of questions that violinist Rachel Barton Pine started receiving after recording Violin Concertos by Black Composers of the 18th & 19th Centuries back in 1997. She could see that her album was helping unlock a new level of interest in violin music written by Black composers, but at the time, she did not have a lot of answers. "I just didn't know yet what existed," Pine said, "this was the extent of my repertoire, these four pieces on the CD." Now, after a major 15-year effort involving the talents, input and research of many experts on the subject, Pine has compiled and confirmed a list of 350 Black composers, as well as more than 900 works by those composers. She also has an answer for students who wish to learn music by Black composers: Music By Black Composers, Violin Volume I, a book of sheet music that was just released this fall. The book, meant for students at a Suzuki Book 1-2 playing level, is the first in a violin series expected to include eight volumes, going from from beginner to advanced concerto playing level. 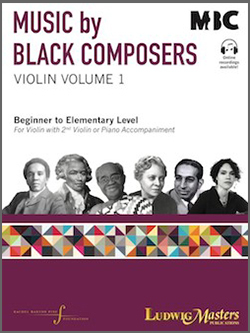 Volume 1 includes 22 works for violin by 16 Black composers, each with accompaniment, with both a second violin duet part and piano accompaniment. Audio and video recordings are available on the Music by Black Composers website (click here) for every work in the book. The works span the years 1767 through 2014, with Black composers from the United States, Brazil, Puerto Rico, Cuba, Ghana, Nigeria, Switzerland, France, and England. BELOW: Violinist Adé Williams plays "The Birthday Party Waltz," by African-American composer Horace Weston (1825–1890) with pianist Milana Pavchinskaya. It is one of the pieces in Music By Black Composers, Violin Vol. 1. The book is part of the Music By Black Composers (MBC) project, an initiative developed by the Rachel Barton Pine Foundation that aims to bring greater diversity to the ranks of classical music performers, composers, and audiences by making the music of Black composers easily available to all. "In the 15 years since we first conceptualized Music by Black Composers, we have had the opportunity to speak with many Black musicians about the importance of role models in the arts," Pine said. "Even today, many aspiring Black students live in a community where their particular town’s orchestra may not even have a single player of color in it or leading it. As much as they may love the music, they don’t see a future for themselves. Our goal is to present a variety of Black leaders representing professions in the classical sphere, so that young people may consider the different avenues they may take in music and see someone who looks like them in that role." To that end, Violin Volume 1 contains not only biographies of each composer, but it also features articles about Black orchestras past and present and about famous African Americans who played violin. (Who knew that Solomon Northup, Frederick Douglass, George Washington Carver, Coretta Scott King and Sheila Johnson all played the violin?) It also includes profiles of three Black role models in classical music: Sphinx founder Aaron P. Dworkin, Chicago-based teacher and performer Lucinda Ali-Landing, and concert violinist Tai Murray. Pine's Music by Black Composers initiative doesn't stop there -- it also has produced a Coloring Book of Black Composers as well as a Living Composers Directory. A timeline poster of 300+ Black composers is in the works. While putting this project together, Pine's team did a statistical survey of top methods for violin, including private methods and school methods. Looking through 12 curricula, they found no works of concert music by black composers; they found only spirituals as folk music. They also found nearly no works by women, and little art music from anywhere but Europe. When it came to the little they found from elsewhere, "the books reflected almost a colonialist attitude," she said, for example, labeling a melody "Filipino tune." Pine is pleased that the Music by Black Composers Violin Book 1 is also diverse in terms of including women composers, including art music from all over the globe, and including a mix of 18th-, 19th-, 20th- and 21st-century works. "In terms of a lot of definitions of diversity, beyond Black composers, our curriculum meets that as well," Pine said. How exactly did this project come about, and how did Rachel Barton Pine wind up spearheading it? "It all started in 1992, when I was concertmaster of the Civic Orchestra of Chicago," Pine said. "I was 17 years old, and at the time Michael Morgan was the assistant conductor of the Chicago Symphony and principal conductor of the Civic Orchestra of Chicago." Chicago also happens to be home of The Center for Black Music Research at Columbia College (CBMR), which Pine describes as "the premiere research organization that looks into music from Africa and the African diaspora - not only classical, but every kind of music you could think of." That year, CBMR collaborated with the Civic Orchestra of Chicago on a special all-Black composers concert. As concertmaster, "I was asked to give the modern-day world premiere of a concerto by an Afro-French composer which hadn't been played since the 1700s," Pine said. It was by Chevalier de Meude-Monpas, and "it was absolutely charming, catchy and appealing, just a great piece." Several years later, when she decided to explore the idea of making a CD of concertos by Black Composers, the Meude-Monpas was foremost in her mind. But she wanted to find more, and that meant doing more research -- something Pine greatly enjoys. "So I went over to CBMR, and as I was walking down the hallway to the stacks of music, I saw a big portrait on the wall, a replica of the famous painting of the Chevalier de Saint-Georges, the 1700's Afro-French composer, born on the island of Guadeloupe, who was originally referred to as 'Le Mozart Noir' -- the 'Black Mozart.'" "You know that is a little bit of an incorrect designation, now that I think about it," she added, "because (Saint-Georges') Sinfonias Concertantes directly inspired Mozart to write his 'Sinfonia Concertante.' So Mozart should have been the 'White Saint-Georges'!" 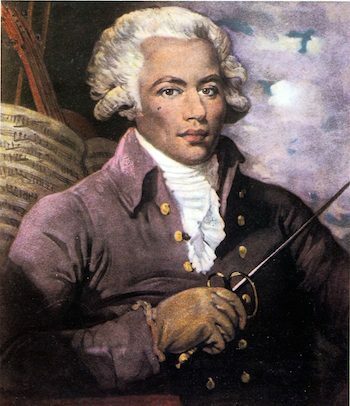 At any rate, when she saw the picture of Chevalier de Saint-Georges in his powdered wig, sword in one hand and violin and music behind him, in her mind, she also saw an album cover. The four concertos she chose for her album were written by Saint-Georges, Joseph White, Samuel Coleridge-Taylor, and then the Chevalier de Meude-Monpas she had played years before. But there was one problem. "For decades the leading Black music researchers had considered (Meude-Monpas) to be among the composers of African descent, because his name, in historic records, was always followed by 'le Noir,'" Pine said. "After my album came out, further research uncovered the fact that had been in a regiment of the French army that all rode black horses, and so the 'le Noir' referred to his mount, rather than his ethnicity! So he's not a Black composer at all, and ironically he's the one who started my whole journey!" Because of that album, Pine found that she was suddenly being asked to sit on diversity panels and to participate in the conversation about Black music and artists. She started learning about advocacy, research and performance from people such as Michael Morgan; Chicago Sinfonietta founder and conductor Paul Freeman; Center for Black Music Research scholar Sam Floyd; musicologist Dominique-René de Lerma and Sphinx Organization founder Aaron Dworkin. The more she learned, the more she realized what a rich history was waiting to be tapped, and that researchers had already found many works by Black composers. Unfortunately, "this was not getting past the ivory tower," Pine said. Academics knew about it, but the general public did not. Pine had been running her Rachel Barton Pine Foundation since 2001, and "it struck me, I had a [non-profit organization], and here was this project waiting to be done. I thought, 'I'll be the one to do it.'" For Rachel, this was a natural fit. "This project aligned with all the things I love and care about: I love music research; I love repertoire, to find as much as I can get my hands on; and I'm passionate about music education." She formed an advisory board of people with a high level of expertise in related areas, including Black music researchers, Suzuki teacher trainers, professors, conductors and more. With input from the advisory board, she came up with the idea of a graded series for violin, beginners to Mendelssohn Concerto level. The books are not a stand-alone curriculum, but a supplemental curriculum, and the books would include histories and pictures of each composer, plus other role model profiles of Black performers, teachers and leaders. "We are planning to do the whole series for violin, then a series for cello, then for viola. After that our focus will be string orchestra, for school orchestras, that's such a large part of our string world," Pine said. "I'll be working on this for decades to come." The project has required a huge amount of primary research, said Pine, who has personally sorted through boxes of manuscripts at libraries all over the world and contacted far-flung relatives of Black composers to retrieve their work. She recruited teachers to go through the first book for pedagogical issues, and she relied on her advisors to help decide which of the many compositions ultimately would go into the book. "I couldn't be objective after, say, spending an entire day at British library - I might want that piece to win!" Pine said. About a dozen colleagues gave their opinion of the finalists, listened to the piece and voted, and "it was always pretty clear which ones won out," Pine said. Pine has been teaching the music to her daughter, Sylvia, who is seven, and she has been pleased to find her daughter singing the pieces and enjoying the rhythms. "It was important to choose pieces that were innately good music, "otherwise you are doing a disservice to the cause. The most gratifying thing is when colleagues say they want to teach these pieces to everyone, because they are pedagogically useful." For example, in the Suzuki books, "we don't encounter 6/8 time until Book 4, but in MBC there is a Book 1 piece in 6/8, there is syncopation, American repertoire, pieces with 123-12 (alternating) Latin-American beats." With the biographies peppered throughout the book, Pine is hoping to inspire Black students to stick with the violin, "to recognize that Black musicians have a place in classical music and have always had a place in classical music." But also, Pine wants everyone to embrace this repertoire, to enjoy it, and to start demanding that concerts reflect the diversity of our world's many artists. November 29, 2018 at 04:48 PM · This is great! So nice to have options outside the white male paradigm. And I love Sylvia's playing! November 30, 2018 at 10:17 PM · Yes, there are some composers that are Black but there compositions are sub standard. They just do not have a sense of melody, they concentrate on rhythmic patterns instead. This is the "elephant" in the room. November 30, 2018 at 10:25 PM · There are compositions by white composers that are substandard, Victor, and by people of any race. Along with inspired, amazing compositions. I don't know how many of "there" compositions you have heard, but I would suggest further educating yourself. December 1, 2018 at 01:08 AM · If you can find a CD of the Jose White violin concerto performed by Aaron Rosand, I think you will be amazed.